Outdoor Pool Season is nearly upon us! For many operators of seasonal pools around the country, this means one thing: the rush to meet the Memorial Day opening date is about to begin. For us, the season starts a couple months out with pool inspections and startup checks. Following a week of pre-season checks, we came up with a list of 5 critical things everybody should be looking at before opening day. Test Kits do have a shelf life, and depending on how long the reagents have been sitting, where they have been sitting they may not provide consistent results. While a new set of reagents may set you back $100-$200 it is well worth it to have a secondary point of reference if you have any “strange” readings from your existing Kit. Do remember that most liquid reagents are good for about a year if you are approaching that timeframe it may be best just to toss them and work with the new set. 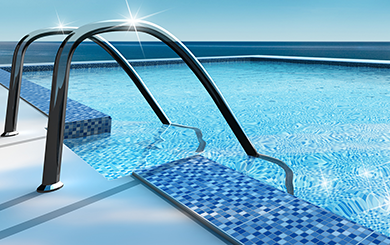 One of the most critical aspects of the opening of the pool is rebalancing it, you should make sure to have plenty of the chemicals on hand typically needed for balancing, if you are unsure of what you need your CPO® book, Taylor Kit booklet and many online sources can be of assistance. Where a service company is contracted to perform the actual startup, make note of the chemicals on the invoice, these are likely the chemicals you should have a supply of on hand. Losing your ability to control pH or running out of chlorine right at the start of the season would be about the biggest problem you could inflect upon yourself. Make sure to have a solid 3-4 week supply right at the start of the season, track the usage closely and reorder before you to get to 1 week worth of supplies. This is a good time to double check that your S.D.S./M.S.D.S. book is complete and up to date. If you do not have them get them, data sheets for your most common chemicals that outline dosing recommendations are also a good thing to have on hand. Opening day is not the time you want to find out that you have broken laterals, a cracked air relieve valve, a clogged heater or some other mechanical issue. We recommend to our clients that they do a full run through of the systems 4-6 weeks out from opening day to allow time to procure any replacement parts or repair services needed. This is not a comprehensive list but rather a good starting point, if you have any comments are additional suggestions, please drop us a comment below. And as always, if you need any assistance in conducting a pre-season check, planning the supply needs or planning for startup please do not hesitate to reach out.